If you watched the news these last few days, you were likely bombarded with images of violence in the streets of Ferguson, as well as in New York City, Los Angeles, Philadelphia, Oakland, and Chicago among others. You saw some people filled with rage, and you watched as they acted out their emotions by burning buildings, looting, turning over cars, and expressing their feelings in unfortunate ways. If you turned on the sound, you heard commentators, government officials, experts, and members of the general public expressing their opinions about the cause of the violence and the state of the nation. If you changed channels, turned the dial, or opened different websites, you witnessed an amazing range of perspectives. What justifies rage? Why do we let our emotions overtake our reasoning? Don’t look for answers here. I am just an observer like most of you. I confess to feeling deep emotions and even anger at the images and opinions I see and hear. Instead of trying to figure out who is right and who is wrong, try to understand what is happening. Try to empathize with the families, the members of the grand jury, the witnesses, the authorities, the peaceful protesters, the local business owners, and the media. Try to grasp what motivates those committing all sorts of despicable and violent acts right in front of our eyes? Understanding their actions is a struggle, perhaps an impossibility. I am incapable of putting myself in their shoes, of seeing the world as they see it. What angers me? It is seeing human beings act irrationally, whether they are torching a police car because they hate the police, or behind a microphone making statements that are obviously untrue. Irrational behavior takes many forms, but when the intentions are malicious and self-serving, and when the consequences are harmful to others, something must be done and rational leaders must come forward. In the last few days, I’ve seen incredible examples of emotional hijacking where people let their emotions shut down their brains. They seem to act like animals, but even that is not fair because animals rarely act in ways that are contrary to their own interests. My dog would never intentionally poop in her own bed. Irrational behavior is dangerous! Its manifestations spread exponentially, like a chain reaction. A word elicits a frown, which causes a scowl, which results in a punch, which leads to a death, which motivates a riot which leads to more death and destruction which ultimately destroys a society. In this sequence, there are times when thoughtful people can and must intervene to prevent the escalation. Ideally, they must act as soon as there is a frown, and before the first scowl. If they allow the punch, it may be too late. 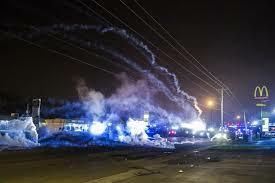 The people of Ferguson started down this path of destruction within minutes of the death of one of their own. For some, their grievances find origins unrelated to this or any current events. They are long-simmering. This present insult opened old scars and brought many sympathizers, as well as those who wished to exploit this tragedy for their own harmful purposes. The agitators, hooligans, and thugs must be arrested and dealt with through the criminal justice system. There should be zero tolerance of their destructive behaviors in our society. As long as these people remain to incite and enrage the mobs, chaos will continue. Thoughtful and credible people within the community need to take charge. They should gather their fellow citizens together, listen to their grievances, and work together to find solutions. Through this participative process the community can heal and forge a constructive vision for its future. A critical mass of people in the town has to invest in such a positive outcome. The community must work together to assist those who have been harmed by this unfortunate episode. They may not realize it now, but if they do trust in each other and commit to finding solutions, a renaissance for Ferguson is possible. The media needs to change its approach. Sensationalizing cherry-picked tragedies distorts our perspective. In a society of over 300 million people, there will be bad news, every day of the year. The networks and the mass media publications have a responsibility to provide perspective and to help their readers and watchers to understand what happened and why. It is not enough to just horrify us and look for people to blame. We need adults reporting the news to us. Each network, every publication, and even colleges of journalism should take a look at themselves and ask what they can do to improve society, not just sensationalize its failings. We the people need to turn off and refuse to buy their distortions. Only the fittest will survive, but we the consumers define which is the fittest. Ironically, we learn as a society. These terrible experiences get our attention, unlike a thousand normal days. I remain optimistic about the future of our country. This entry was posted in Human Behavior, Media and tagged Ferguson. Bookmark the permalink.